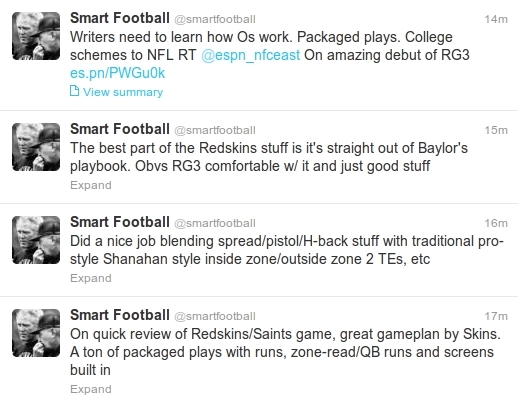 Smart Football ‏@smartfootball 26 Jan — Can we drop the phrase “arm talent”? What happened to “strong arm”? I’ll note the phrase “exceptional control” seems to cover what Trent is trying to get at with the phrase “arm talent” as well. And this gets us back to an issue often seen in both coaching and fan circles. Ideas aren’t always born in the minds of the best writers. Some very ordinary folks come up with original, profound, or perhaps just useful concepts and they end up expressing them a little awkwardly. I can’t help but wonder how much more penetration the modern analysis of play by play data would have if we didn’t have to deal with awkward, and sometimes confusing language. If Brian Burke had used the Bill James phrase “Win Shares ” instead of Win Probability Added and perhaps “Net Points” instead of Expected Points Added, how much faster would his analysis been assimilated? In my discussions of expected points curves, I can get gnarled up in the phrase, “the value of a touchdown”, because that has two distinct meanings, depending on your point of view. If you’re thinking about adjusted yards per attempts formulas, that term refers to what I’ve called a “barrier potential” in other contexts. It’s considered the value of the touchdown because of some unfortunate language and usage in The Hidden Game of Football. The other notion called the “value of a touchdown” is the average score of a touchdown (7 points in general, by logic well discussed here) minus the yardage value of the average kickoff return. 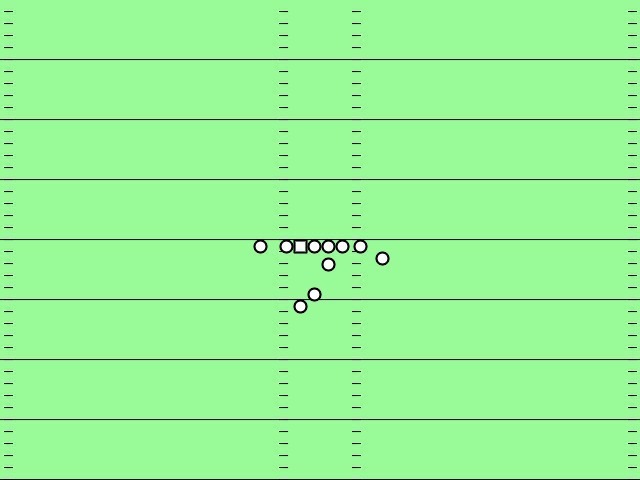 For years this was around 6.3 to 6.4 points, because the average return was to about the 27 yard line. This term has to be larger now, with the recent adjustments to the kick off line. This value has meaning in expected points curves, and the Romer/Burke model explicitly uses this notion of the value of a touchdown. The one driving me nuts these days is 5-technique, applied in sloppy fashion to a defensive end of any kind. The term gets used whether or not the defensive end is actually using a 5 technique (on the outside shoulder of the OT), a 4 technique (directly opposing the OT) or a 3 technique (outside shoulder of the OG ). Especially in drafting circles, people start talking about 5 techniques as a draftable position, as opposed to a place you line up and a way you play. More accurate, in drafting circles, would be to talk about ends capable of one or two gap technique, instead of this “5” nonsense. Image taken from Jene Bramel article, Fifth down blog. Standard alignments shown. Note when DL “on” a player, the numbers are even (0,2,4,6 etc). 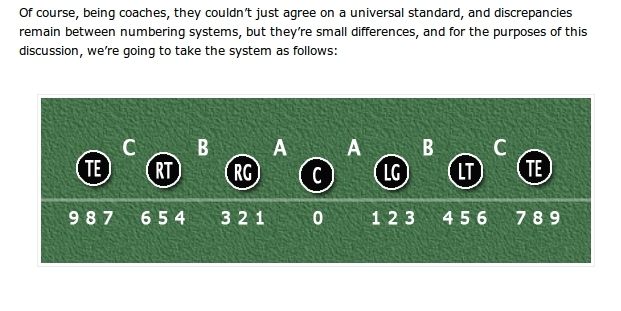 In a majority of systems, even numbers denote an alignment that is head-up or helmet-to-helmet on an opposing offensive lineman while odd numbers denote an offset alignment, i.e. over the inside or outside shoulder of an opposing lineman. Pro Football Focus just had to go and mess it up. Screen capture of the link above. Note the numbering of the “on” positions goes 0,2,5,8. This would not happen but for the loss of meaning of the phrase “5 technique”. People *pay* to be told these kinds of explanations? After looking it up in several books, I have a sense that the Eagle defense generally has something to do with shifting the defensive tackle or end outside the weak tackle or tight end and putting a linebacker over or on the weak tackle or tight end. Until the football coaching world gets more precise and consistent, the word “eagle” should be dropped. The three sites we noted last year: Cool Standings, Football Outsiders, and NFL Forecast, are at it again, providing predictions of who is going to be in the playoffs. Cool Standings uses Pythagoreans to do their predictions (and for some reason in 2011, ignored home field advantage), FO uses their proprietary DVOA stats, and NFL Forecast uses Brian Burke’s predictive model. Blogging the Beast has a terrific article on “the play”. If you watched any Dallas-Philadelphia games in 2011, you’ll know exactly what I mean, the way with a simple counter trap, LeSean McCoy treated the Cowboys line as if it were Swiss cheese. Not my photo. This is from Chris Brown’s Chip Kelly article (see link in text). as an example. Have you ever seen a better photo of the gap assignments of a defense? If more folks followed Chris Brown, rather than getting their play design from such “experts” as Michael Lombardi and Charlie Casserly (1), maybe I wouldn’t need to repost a cut from his twitter feed, but under the circumstances, I think it’s the best thing to do. A good chunk of Baylor’s offense migrated over to the Redskins. That includes some pet packaged plays from the Baylor playbook. This lack of understanding of packaged plays (see here and here) badly afflicts football fans, and the worst are the ones “who don’t need to read the article” to figure out what Chris is talking about. They think he’s talking about audibles. Sorry, packaged plays are not audibles. In Dan Graziano’s article, he interviews Shanahan and mostly confuses the issue.. So I asked Shanahan if this had been by design — if he’d set up that first drive with those quick passes to help his rookie get into the rhythm of the game without facing pressure from the Saints’ defense or pressure to go through progressions while he got his feet under him. Because I figured, if it had been, it was a pretty smart idea. So how about that, right? Here I was, ready to give the veteran coach credit for a wise game plan that had helped his rookie quarterback ease into his first NFL game, and it turns out it was the rookie quarterback who’d made that decision on his own. Duh. RG3 doesn’t get the option unless Shanny puts it into the playbook in the first place. 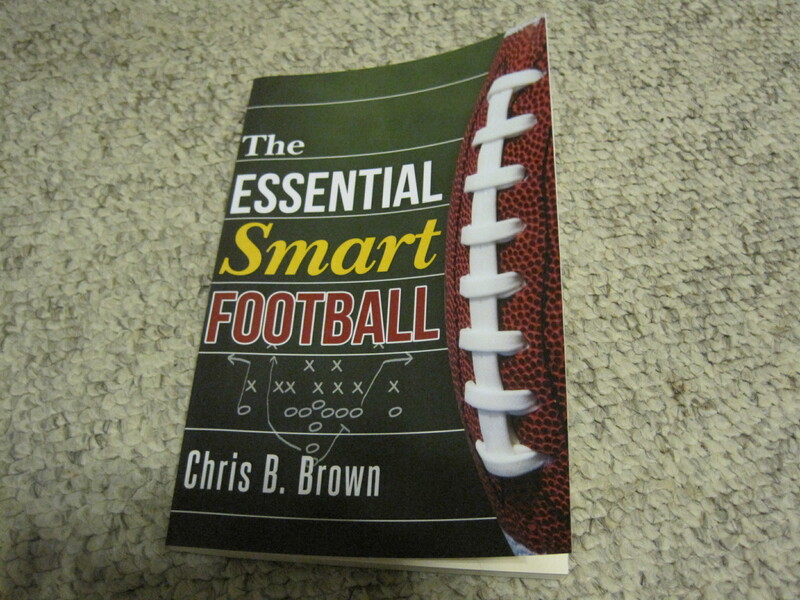 (1) I was actually told by a fan that in order to understand how plays work in the NFL, I needed to stop paying attention to Chris Brown and pay more attention to Charlie Casserly and Michael Lombardi, as those two had forgotten more about play calling than Chris Brown ever knew. I think this says more about the state of affairs in certain elements of football fandom than it does about the relative expertise of these three. I recall a time in my early teens when I participated in a judo club, a small one whose regular competition was one of the largest and most proficient judo clubs of its era. Our competition, in a period when no one had a black belt higher than sixth degree, had a fourth degree black belt, and whose club officers tended to be officers at the national level in the United States Judo Association. Having come to my full height, but not my build, I was tall and awkward, and in matches, tended to be paired with younger members of the better club. Those men were smaller, lighter, faster, more skilled and more nimble. I lost a lot of matches before I ever won one. When I finally won, it was because my opponent was clearly out of balance. He was afraid of my legs, and was leaning into me as we took hold of each other. It was over in seconds. I executed a clean sacrifice throw. I slipped under him, the arch of my right food cut off his left ankle and he rolled across the mat. It wouldn’t have been possible if my opponent hadn’t been out of position. An ancient “packaged play”. You run if the cornerback follows the flanker. You pass if the cornerback forces the run. Oversimplifiying a little, skill in judo is being able to recognize what an opponent is doing and using what he is doing against him. In a real match, seldom is it as easy as beating an opponent off the bat. You have to recognize what the opponent is doing in the match and counter appropriately. 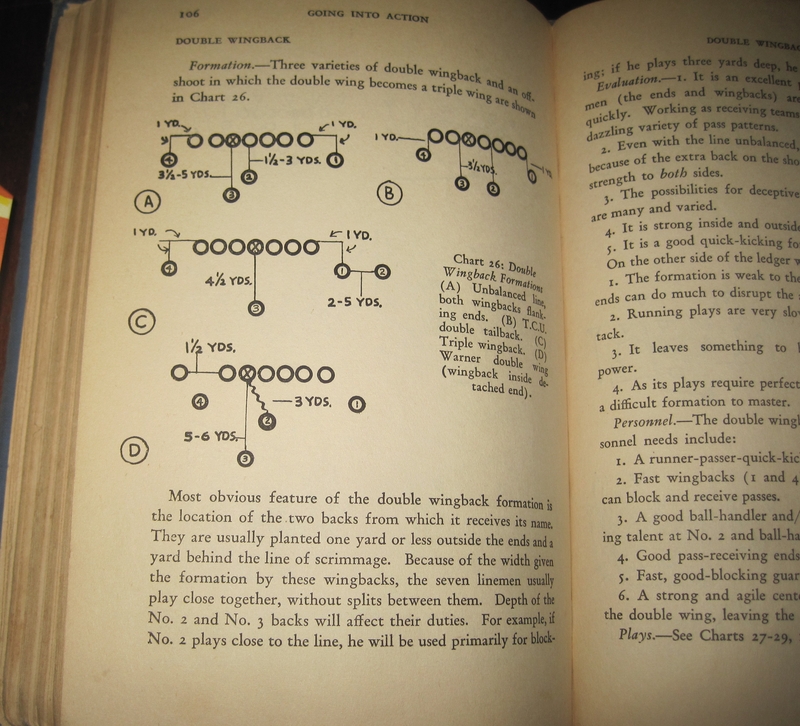 Counters in football are old, and perhaps the most accessible explanation of an offensive system and the appropriate counter responses is the set “Vince Lombardi on Football.” In it, they mention the halfback option, a single wing play carried over into the strong side offense of Vince Lombardi’s Giants and Packers teams. We’re going through this long introduction to add a nuance to Chris Brown’s phenomenal discussion of packaged plays, which take the essential idea of judo, and also the halfback pass option, and shows how using an opponent’s own reactions against him are now at the forefront of modern football. Understand, in an traditional option, as in the modern packaged plays, which way the play goes depends on how the play turns out. There are keys and the offense is reading (keying) on the defense. This isn’t the same thing as an audible. When trying to explain packaged plays to folks who have never read Chris’s article, the most common mistake is to think these plays are audibles. An audible is a pre-snap adjustment of a play. A “packaged play” is a play with 2 or 3 options with built in reads after the play begins. The thing that makes these plays interesting, is the imaginative combination of run and pass options, with passes to isolate and pick on the reactions of specific defenders. To imagine one combination, think of a strong side run combined with a curl in by X in a pro split T, strong right. The quarterback reads the outside linebacker and left cornerback to see which way to go. It’s potentially a way to exploit an overpursuing linebacker. I find these notions pretty exciting, another rachet up in the cat and mouse game that dominates offense and defense. I can’t help but feel that better play design is a substantial component of the offensive explosion of the past few years. The idea that “players are getting bigger” can’t entirely account for this; they’re getting bigger on both sides of the ball. Game video should benefit both sides. But if we’re in the middle of a new kind of play design, one that can isolate players at will and make their own natural reactions the enemy, then that kind of play design could in fact be “the thing” that’s powering the offenses of the 2010s. Is the spread option merely a single wing? It’s an easy thing to say and claim, that any offense that has a quarterback 4-5 yards back from the line of scrimmage and that has a running orientation must descend from the single wing formation. In the case of the spread option, I don’t know how comfortable I am with this idea. For one, the name spread option suggests a lineage that comes from the spread itself, or the shotgun, which Y.A. Tittle once compared to the short punt formation. Many teams had put the quarterback in a Short Punt Formation before, but Hickey’s version apparently caught everyone’s fancy. It was an overnight sensation. That, in a nutshell, is the idea I’m interested in developing, that shotgun + option = spread option, and signs of single wing descent aren’t in any sense as easily proven as people claim. A point, critical in thinking about this, is how someone like Urban Meyer or Gus Malzahn could have been taught single wing principles in the first place. 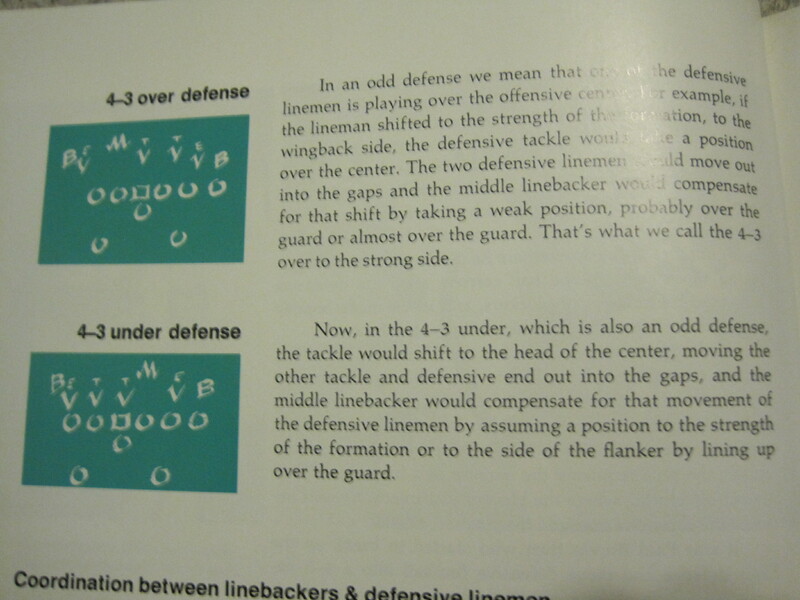 By the early 1970s, when I first became aware of football, the single wing was a dead offense. The single wing was functionally obsoleted by 1940. Fritz Crisler and the invention of platooning notwithstanding, Clark Shaughnessy’s version of the T was just too explosive for the old single wing to survive. 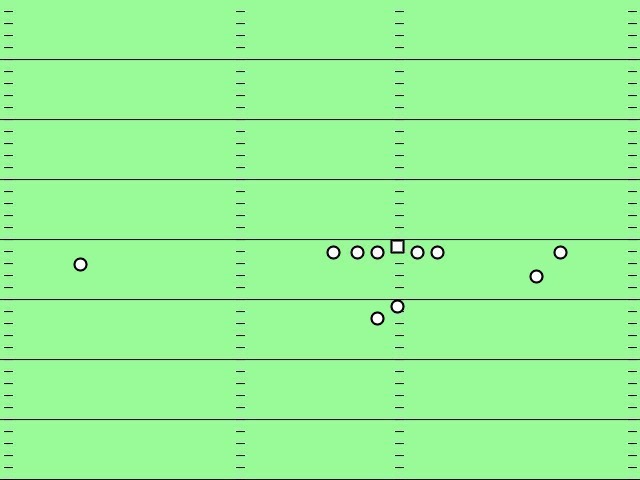 By the 1970s, the only formation where the quarterback wasn’t behind center was the shotgun, and the shotgun, in those days, was primarily a passing formation. Single Wing ca 1945. Line spacing 6 inches, except for wingback and ends. Except for the spinner cycle, it does not afford much opportunity for deception. 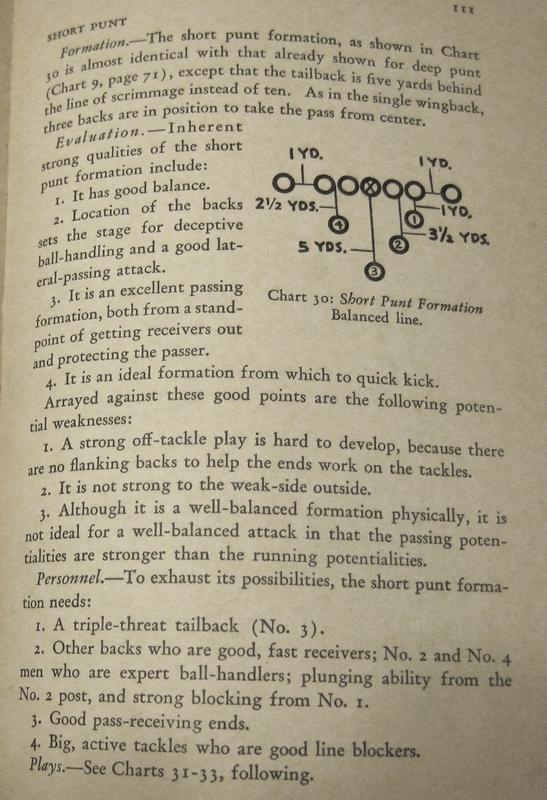 Now, to note, as the site Hickock Sports points out, there really were 5 formations in common use before the Shaughnessy T came into prominence, and those included the double wing, the short punt, the Notre Dame box, and the old T formation (played largely by the Chicago Bears). We’ll show some photos of the double wing and the short punt from Dana’s book, followed by a sample of a spread option formation. 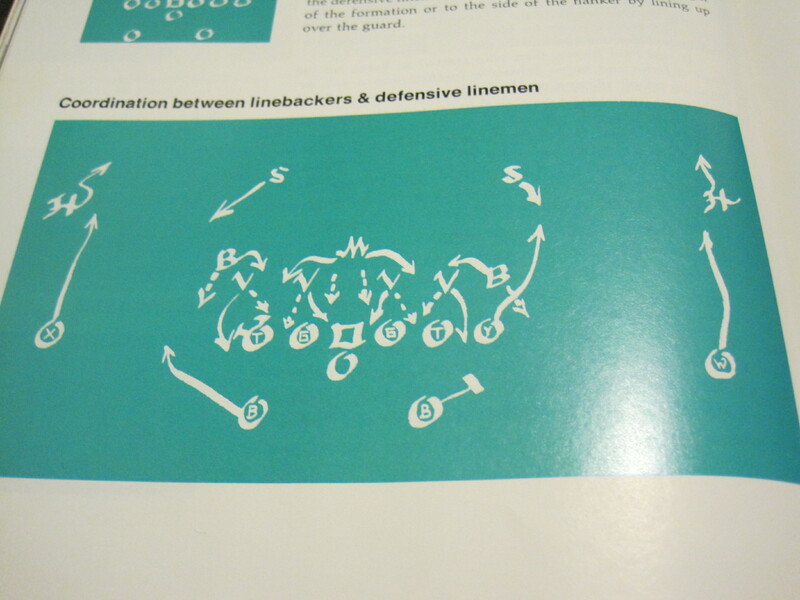 So of the formations above, which does the modern spread option most resemble? The “A” version of the double wing, by my eyes. What passing trends are of note between the 1930s and today? A more aerodynamic ball, and the ability to pass anywhere behind the line of scrimmage (rule change, 1933) helped power a ever growing passing explosion into the 1940. 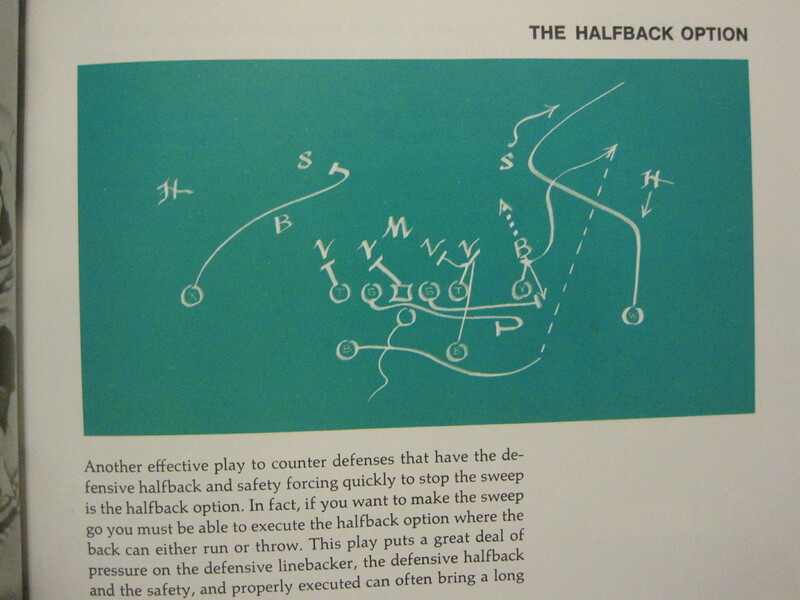 In the 1950s, Paul Brown introduced timing patterns, by carefully watching how Don Hutson played. The late 1950s gave us, via Johnny Unitas and Raymond Berry, the 2 minute drill. The 1960s gave football Sid Gillman and his foray into attacking the whole field. In the 1970s, the Dallas Cowboys revived the shotgun, and one of the elements introduced then was a blind shotgun hike. Get to the early 1980s, and the more wide open passing games of the San Diego Chargers and later, the Washington Redskins, and formations (pro I, pro T) that were almost etched in stone begin to evolve. Also, in the 1980s, the West Coast Offense emerged, and the ideas of stretching a passing defense horizontally, and further, that passing can substitute for running as a ball control weapon. By the late 1990s and into the 2000s, “ace” backfields became more common, the shotgun was used more and more. And as teams pushed for more and more wideouts, to spread the defense, to get defenders to cover more and more of the field, the counterbalancing question began to emerge: how do I get more running out of an essentially passing formation? Consider the running game, from single wing to now. The single wing excelled in power off tackle running, perhaps exemplified by the cutback. Blocking was sustained, double teams by the wingback and tackle forming a crucial part of the game. Once the Shaughnessy T was introduced, blocks weren’t nearly as enduring. Away from the play, brush back blocks were enough. Because the blocks were fast, and the play started earlier (blind hikes), the game became faster. The single wing cutback later formed the archetype for the Green Bay sweep. But nuances introduced around this time span include area or do-dad blocking, and the whole notion of running to daylight. The first read of a “zone-read,” it will be recalled is by the quarterback: he reads the backside defensive end, who typically goes unblocked in a zone-rushing scheme to free up blockers for double-teams on the frontside. If the defensive end sits where he is or rushes upfield, the quarterback simple hands the ball off to the runner. But if he chases the runningback, the quarterback pulls the ball. On the base zone-read, the quarterback just looks for any crease to the backside. The zone read is the backbone of the spread option, and simply put, the option, much less the blocking patterns of the zone read, didn’t exist back in 1936. Q: If the two offenses don’t come from a common origin, why so many apparent commonalities? In explanation, consider how in biology there are cases of convergent evolution. Though of unrelated origin, the eye in squids and mammals are very structurally similar, with the interesting exception that the squid eye, nerves are wired to the retina in the back, while with mammals, the retina is wired to the nerves in the front. Often, little details tell the story when distinguishing lineages. Certainly, the coaches who developed today’s modern offenses, like Rodriguez and Malzahn, did not spend their time meticulously studying the single-wing tapes of yesteryear. Instead, if there are similarities it’s because those coaches stumbled onto the same ideas through trial and error. 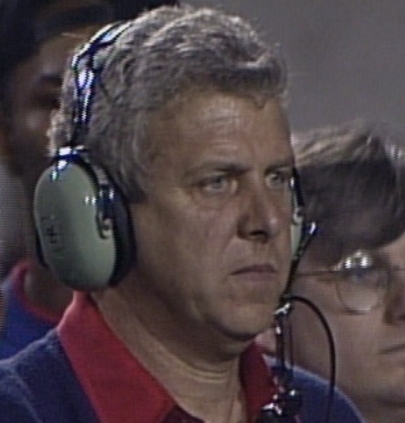 The purpose of the running game: as Bill Parcells was, Rex Ryan is. In Brian Burke’s recent roundup, he references a Fifth Down blog article on Rex Ryan’s philosophy of offense, one where running is heavily emphasized and the yardage? Not so much. He then says that as an offensive philosophy, it seems to be “ridiculous”, except in the metaphoric sense of a boxer, with a jab, using the run to keep an opponent off balance, so that he can lay out the “killing blow”. I tend to think that Brian’s boxing metaphor is, at best, an incomplete picture. For one, he doesn’t see the jab as a knockout punch, but for Muhammad Ali, it was. Another point is the jab is fast, elusive, confusing. By contrast, the run is a slow play, and there is nothing particularly elusive or confusing about the run. Rex-like coaches often run when it is most expected. The way Rex is using the run, in my opinion, is closely tied to the way Bill Parcells used to use the run, especially in the context of Super Bowl 25. This New York Times article, about Super Bowl 25, details Parcells’ view of the philosophy neatly. Parcells' starting running backs averaged about 3.7 ypc throughout his NFL coaching career. The purpose, of course, is time control, optimizing time of possession, and thus reducing the opportunity of the opposing offense to have big plays. It’s a classic reaction to an opponent’s big play offense, to their ability to create those terrific net yards per attempt stats . Note also Rex is primarily a defensive coach. If the game changing, explosive component of a football team is the defense, doing everything to suppress the opponent’s offense only hands more tools to the defensive team. It forces the opponent’s offense to take risks to score at all. It makes them go down the field in the least amount of time possible. It takes the opponents out of their comfort zone, especially if they are used to large, early leads. The value of time, though, is hard to quantify. Successful time control is folded into stats like WPA, and thus is highly situation dependent. The value of such a strategy is very hard to determine with our current set of analytic tools. Total time of possession no more captures the real value of time any more than total running yards captures the real value of the running game in an offense. Chris, from Smart Football, says that the classic tactic for a less talented team (a “David”) facing a more talented team (a “Goliath”) is to use plenty of risky plays, to throw the outcome into a high risk, high reward, high variance regime. The opposite approach, to minimize the scoring chances of the opposition, is a bit neglected in Chris’s original analysis, because he assumed huge differences in talent. However, he explicitly includes it here, as a potential high variance “David” strategy. It’s ironic to think of running as the strategy of an underdog, but that’s what it is in this instance. New England is the 500 pound gorilla in the AFC East, ranked #1 on offense 2 of the last 4 years, and that’s the team he has to beat. And think about it more, just a college analogy for now: what teams do you know, undersized and undermanned, that use a ground game to keep them in the mix? It’s the military academies, teams like Army, Navy, and the Air Force, using ground based option football. The down side of a loose attitude towards first and second down yardage is that it places an emphasis on third down success rate, and thus execution in tough situations.